Vladimir Putin’s phony war in Crimea: The Russian president’s invasion of Ukraine is based on his paranoia. 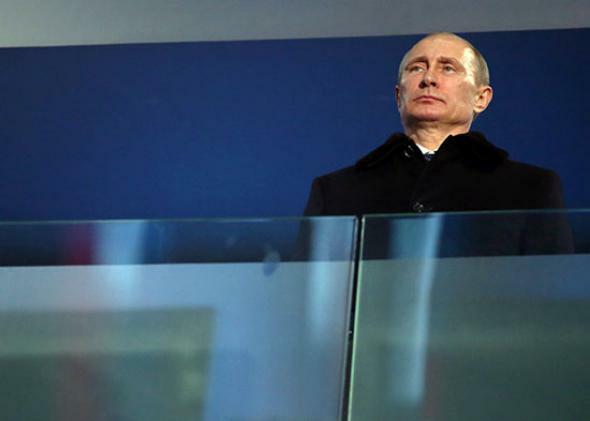 How Vladimir Putin concocted a conflict to soothe his own paranoid fears. Vladimir Putin’s real intent is to buffer the Russian heartland from Western influence. The most tragic thing about the conflict in Crimea is that it’s a tremendous fake, concocted in the Kremlin to soothe Russian President Vladimir Putin’s growing paranoia. As the Ukrainian province braces for a referendum on independence Sunday, the de facto Russian occupation of Crimea is still a phony war, with no shots fired and no official belligerents. Yet with every passing day, the likelihood of bloodshed rises in the region, where just two weeks ago ethnic hatred and secessionism were practically nonexistent. The Kremlin intervention isn’t about a victimized Russian population in need of protection. Crimeans of all ethnicities are united in their suffering from government neglect, corruption, and poverty; Russian speakers make up the majority of the peninsula’s population; and the Muslim Crimean Tatar minority is at the greatest risk of persecution, especially if there is a split. Besides rehashing tired tropes of Red Army victories over Nazis in World War II, the Kremlin has no ideology. What it still does have is a treasury full of petrodollars to buy loyalty—or at least acquiescence—from tactical allies. It was exactly the tradition of murky multibillion dollar deals with Ukrainian leaders that first brought out protesters to Kiev’s Maidan square against President Viktor Yanukovych, Putin’s chief client, in November. When Yanukovych fled to Russia after massacring dozens of demonstrators last month, Putin turned his attention to Crimea, a forgotten part of Ukraine with the weakest allegiance to Kiev and home to Russia’s Black Sea Fleet. The Sicily-sized peninsula is rural and conservative, and many families have connections to the Soviet or Russian militaries going back generations. The region’s frail economy is dependent on summer tourism from Russia. To Crimeans, Russia has been a rich, powerful, and welcome neighbor. Yet when I traveled to the Crimean capital Simferopol just days before the Russian invasion, nobody gave me the impression that their region was on the brink of seceding and joining Russia. Members of the Russian-speaking majority weren’t angry because of discrimination by Ukrainians, but rather because successive national governments had ignored Crimea, which formally holds the status of an “autonomous republic” within Ukraine’s borders. People were nervous about whether the interim government in Kiev would take revenge on the region, as Crimea used to be Yanukovych country and largely opposed the anti-government protests on the Maidan. At a Feb. 25 pro-Russia rally in front of the Crimean parliament building, attended by a few hundred protesters, I met Yevgeny Tishchenko, 55, a local artist. Simmering ethnic hatred of the kind that exploded on the Balkans 20 years ago has been absent from Crimea. When the Crimean Tatars, who had been deported to Central Asia by Joseph Stalin, began returning to their homeland in the late 1980s, there were inevitable disputes over land ownership. But the Tatars’ overall success in reintegrating into Crimean society is the real news—and the reason most of them remain staunchly loyal to the Ukrainian state. A referendum cobbled together in less than two weeks in the presence of thousands of undercover Russian soldiers will hardly show the true will of Crimea’s people, especially since the Crimean Tatars have pledged to boycott it. The Tatar community, which makes up 14 percent of the population, now fears it will be targeted as a result. Crimea’s actual conflict isn’t ethnic; it’s the split between the suspicious, fearful sovok, or Soviet, mentality and a new generation of free minds. It’s little surprise that tearing down statues of Vladimir Lenin, founder of the Soviet Union, has become so controversial. Ukrainian citizens who reject Kremlin rule in favor of a European path are generally young, urban, and better educated. For those who are older, poorer, and dependent on government handouts, Moscow looks like a more reliable patron than Kiev. When I interviewed Sergei Aksyonov, now the secessionist Crimean prime minister, at the end of February, he was still an obscure politician whose Russian Unity party held only three seats in Crimea’s 100-member assembly. His office was accessible via a garage door and up two flights of stairs in a downtown Simferopol office building without a street number. Aksyonov, 41, explained that his party was only interested in defending the rights of Russians and had nothing against other ethnic groups. What struck me most about Aksyonov was his lack of nationalist fervor. I later learned that Crimeans whisper that in a previous life, he was a local gangster nicknamed “Goblin.” It must have been the opportunity of a lifetime: Aksyonov secures his future as Putin’s newest client in return for handing over Crimea to Russia. Aksyonov is not just an accidental prime minister but an accidental pawn in a geopolitical chess match played by the Kremlin. Of course Russia had a plan—with or without Aksyonov—but its execution was justified by a crudely improvised political charade. The swift, bloodless seizure of strategic locations across Crimea suggests a long-standing military contingency plan. Intriguing—and not widely reported—was the appearance of Vladislav Surkov, the Kremlin’s former chief ideologue, in Simferopol two weeks before Russian troops started popping up around Crimea. Formally responsible for Abkhazia and South Ossetia, the two breakaway republics that Russia helped split off from Georgia in 2008, Surkov was spotted in Ukraine at least twice this year before Yanukovych’s downfall. At the same time, since Russia was basing its intervention in Crimea on an invented pretext, it became embarrassingly clear that not everyone was singing from the same song sheet. Even now, the Kremlin maintains that the armed, uniformed men in Crimea are local self-defense forces and not Russian troops. Yet Aksyonov and self-defense militiamen on the ground spent the first few days of the occupation claiming they had no clue who the soldiers were—in fact, Aksyonov cited their very presence as a reason for needing Putin’s aid. On March 1, the Russian Foreign Ministry angrily condemned an attempt by provocateurs from Kiev to seize the Crimean Interior Ministry overnight. Within hours, the Crimean Interior Ministry issued a statement angrily denying that anything of the sort had taken place. The date of the referendum was moved forward twice, with the Crimean government initially insisting that it was only about greater autonomy. Days later, it suddenly became a question of quitting Ukraine and joining Russia. The slapdash approach to the fate of 2 million Crimeans belies any real concern for their future, and the choice they will make is a foregone conclusion. His words proved to be prophetic.